Global terrain is a virtually limitless terrain representing a certain fragment of Earth's surface. It can be generated on the basis of ordinary raster images and/or GIS data. In case of using GIS data, appearance of the global terrain object is determined by the accuracy and availability of geospatial data. It should be noted that there are areas of Earth's surface with only low-resolution data available or even no geospatial data at all. This type of terrain can be successfully used for flight simulators: most of the time the plane remains at a very high altitude and low-resolution data is sufficient. High-resolution data is necessary only around landing and take-off areas. There can be only one Global Terrain object on the scene. Memory consumption increases significantly when several viewports are used. To simulate overhangs and caves use static meshes. Global Terrain Details article to learn more about setting up visual representation of the global terrain. Landscape tool article to learn about global terrain generation. An ObjectTerrainGlobal class to edit global terrain via C++, C# or UnigineScript API. Height data generated on the basis of GIS elevation data or height maps (if non-georeferenced data is used for terrain generation). Albedo data generated on the basis of GIS satellite imagery data or albedo textures (if non-georeferenced data is used for terrain generation). Normal data generated on the basis of height data. Masks data generated on the basis of landcover data. Global terrain has a regular grid and is represented as a tileset. Each tile has a fixed size of 128 x 128 pixels. The number of tiles in each dimension (X and Y) is determined by the area size and data density. The higher the density the more tiles will be generated for the corresponding tileset. E.g. suppose we have a height data texture with the density of 100 meters per pixel for an area of 50 square kilometers. Thus, we need (50000/100) x (50000/100) = 500 x 500 pixels which can be covered by 4 x 4 tiles. Terrain tiles are stored on disk using a special format. The number of tiles, that can be stored on a disk is limited only to its capacity. At run time, the tiles around the viewpoint are automatically loaded to GPU memory according to visibility distances specified for corresponding LODs. These visibility distances determine the number of tiles to be loaded and can be automatically reduced by the Engine in case if a GPU memory limit was reached. Visible tiles change as the viewpoint moves along the terrain. Changing visible tiles while moving the viewpoint. A level of detail (LOD) system automatically adapts the available resolution of terrain grid according to the distance and loads corresponding tiles. Every particular data layer has its own number of LODs. Each LOD of a particular data layer is represented by a separate tileset and has a number of parameters according to data layer type. Each LOD has its own density (in meters per pixel) which determines the size of its tileset. The higher the LOD density, the bigger the LOD tileset (the density is multiplied by the size of a single tile). The maximum number of LODs for each of the data layers is limited to 32. LODs are loaded and cleared in accordance with corresponding distances specified in the TerrainGlobal tab. These distances are to be used to avoid delays and provide smoothness when switching between LODs as well as to ensure efficient memory use. Resolution and visibility distance together determine the number of tiles to be loaded around the viewpoint. As it was mentioned, there might be no data available for a more detailed LOD of a certain area. 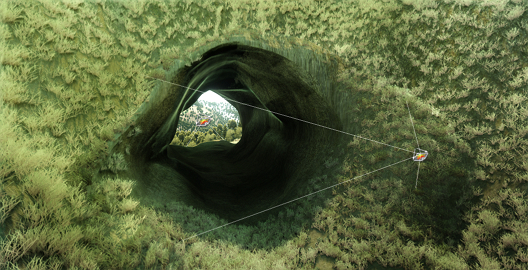 In this case the values of the two adjacent LODs are blended together to provide a smooth look without sharp edges or black holes. Blending is performed by means of linear interpolation on the basis of masks generated by the Landscape Tool for a certain tile. Masks are generated only for those tiles that contain the border between areas with different resolution. LOD1 with the resolution of 100 meters per pixel - green area. LOD0 with the resolution of 30 meters per pixel - orange area. In this case masks will be generated only for the tiles marked with M.
You can only create a global terrain object using the Landscape Tool. Please refer to the Creating a Terrain and Creating a Geo-Referenced Terrain articles to learn more about terrain generation in the Landscape Tool. Global terrain parameters can be adjusted via the TerrainGlobal tab of the Parameters window. Each data layer contains a list of LODs with corresponding parameters. Parameters of a certain LOD of the height data layer can be accessed via the Height LODs group of the TerrainGlobal tab of the Parameters window. You can add a new LOD or remove an existing one by clicking Insert or Remove respectively. TerrainGlobal parameters, Height LODs group. 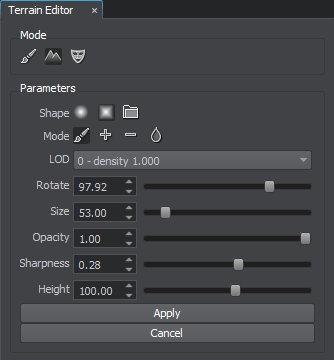 Enabled - enable or disable the current height LOD. Intersectable - enable or disable intersection detection for the current height LOD. Collidable - enable or disable collision detection for the current height LOD. Cast Shadow - enable or disable shadows casting for the current height LOD. You can use this parameter for performance optimization: disable shadows casting for the high poly LODs and enable for the low poly ones. When only the low poly LOD casts shadows, the high poly LOD may be shadowed in areas where it shouldn't be. To reduce such an effect, use the Shadow Offset parameter of the terrain material. Viewport - viewport mask for the current height LOD. Intersection - intersection mask for the current height LOD. Collision - collision mask for the current height LOD. Path - path to a folder, in which the current height LOD is stored. Visibility distance - the distance starting from which the tiles of the current height LOD become visible. Load distance - the distance starting from which the tiles of the current height LOD are loaded into memory. Clear distance - the distance starting from which the tiles of the current height LOD are removed from memory. Video memory usage - memory consumption of the current height LOD. Parameters of a certain LOD of the albedo data layer can be accessed via the Albedo LODs group of the TerrainGlobal tab of the Parameters window. TerrainGlobal parameters, Albedo LODs group. Enabled - enable or disable the current albedo LOD. Viewport - viewport mask for the current albedo LOD. Path - path to a folder, in which the current albedo LOD is stored. Visibility distance - the distance starting from which the tiles of the current albedo LOD become visible. Load distance - the distance starting from which the tiles of the current albedo LOD are loaded into memory. Clear distance - the distance starting from which the tiles of the current albedo LOD are removed from memory. Video memory usage - memory consumption of the current albedo LOD. Parameters of a certain LOD of the normal data layer can be accessed via the Normal LODs group of the TerrainGlobal tab of the Parameters window. TerrainGlobal parameters, Normal LODs group. Enabled - enable or disable the current normal LOD. Viewport - viewport mask for the current normal LOD. Path - path to a folder, in which the current normal LOD is stored. Visibility distance - the distance starting from which the tiles of the current normal LOD become visible. Load distance - the distance starting from which the tiles of the current normal LOD are loaded into memory. Clear distance - the distance starting from which the tiles of the current normal LOD are removed from memory. Video memory usage - memory consumption of the current normal LOD. Parameters of a certain LOD of the masks data layer can be accessed via the Mask LODs group of the TerrainGlobal tab of the Parameters window. TerrainGlobal parameters, Mask LODs group. Enabled - enable or disable the current masks LOD. Viewport - viewport mask for the current masks LOD. Path - path to a folder, in which the current masks LOD is stored. Visibility distance - the distance starting from which the tiles of the current masks LOD become visible. Load distance - the distance starting from which the tiles of the current masks LOD are loaded into memory. Clear distance - the distance starting from which the tiles of the current masks LOD are removed from memory. Video memory usage - memory consumption of the current masks LOD. You can extract data from .UTS tileset files using the TilesetFile console tool. data.uts + data.utsh - tileset containing details data for all tiles of the terrain LOD. masks.uts + masks.utsh - tileset containing mask layout data for the details terrain LOD. data.uts + data.utsh - tileset containing height data for all tiles of the terrain LOD. masks.uts + masks.utsh - tileset containing mask layout data for the height terrain LOD. data.uts + data.utsh - tileset containing imagery data for all tiles of the terrain LOD. masks.uts + masks.utsh - tileset containing mask layout data for the imagery terrain LOD. data.uts + data.utsh - tileset containing normals data for all tiles of the terrain LOD. masks.uts + masks.utsh - tileset containing mask layout data for the normals terrain LOD. landcover masks for each type of generated landcover objects stored in separate folders with the corresponding names. vector_data masks for each type of generated vector objects stored in separate folders with the corresponding names. 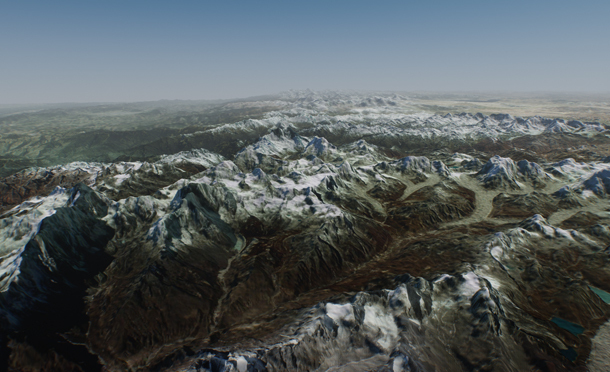 You can edit any height, albedo or mask LOD of the global terrain object using the Terrain Editor tool. To start editing the current terrain, click the Edit button at the top of the Terrain Global tab of the Parameters window. The Terrain Editor window will be displayed. When you're done editing the terrain, click either Apply to apply all changes and exit the terrain editor, or Cancel to discard your changes. Please refer to the Manual Terrain Modification article to learn more about manual terrain modification with brushes. 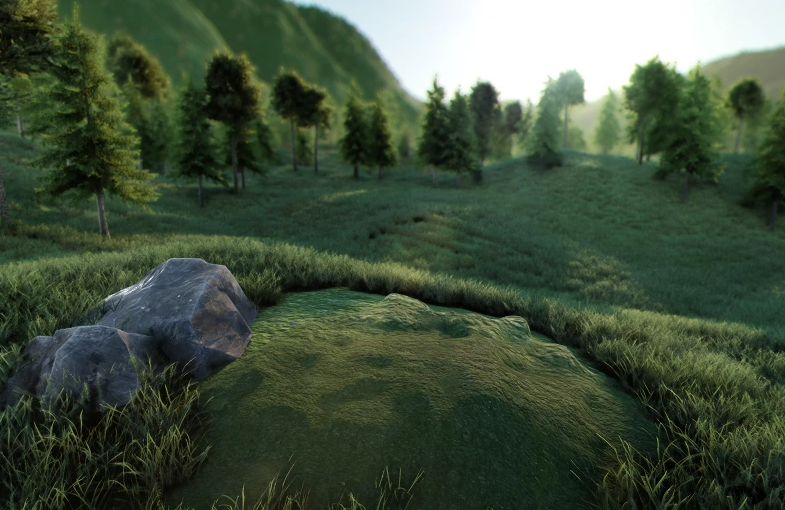 The terrain takes part in physics simulation if it has a standard surface_base property assigned. Collisions with physical bodies use the most detailed LOD 0 and are handled within a set distance, where simulation of physics is in effect. Physical interaction can also be enabled for each of the height LODs by setting collision and intersection flags and masks. To provide the most accurate collision detection use the most detailed LOD. Collisions are calculated for untessellated terrain geometry which may differ from the rendered geometry that is seen. Thus, in certain cases objects may seem "flying" above the terrain surface. Hardware tessellation is controlled by the GPU, not the engine. Therefore, tessellated geometry may vary. Some performance optimizations of the global terrain object, such as oblique frustum and backface culling, may lead to graphic artefacts in case if planar reflections or oblique frustum are used with a low-poly terrain. In case of excessive culling, when too many polygons are removed (e.g., can be noticed in incorrect water reflections of the terrain), it is recommended to reduce the values of Oblique Frustum Culling and Back Face Culling parameters of the terrain_global_base material. In some cases you may need to cut out an area of the terrain surface. For this purpose the Decal-Based Holes feature is supported by Global Terrain. Place any decal (orthographic, projected or a mesh one) with the decal_terrain_hole_base material assigned over the desired location. This will create a hole in the terrain surface. A decal-based hole in a terrain with a circle mask applied. Intersection and collision accuracy significantly depends on the terrain polygon count. The higher the number of polygons, the higher the accuracy. You can improve the landscape by integrating complex meshes into it and thus creating more detailed areas than the Global Terrain is able to provide due to limited density. Enabled Terrain Lerp state of the mesh_base material marks an object to be covered by projected textures of the Global Terrain. The feature is suitable for creating any insets such as caves and tunnels through mountains on the terrain. 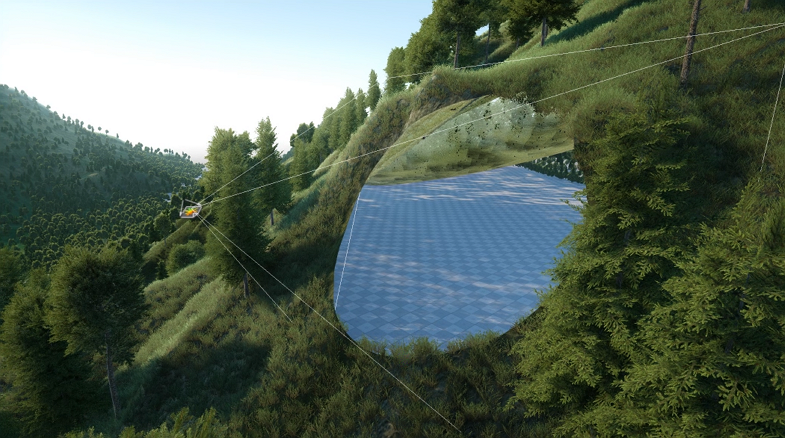 As an example, on the picture below a tunnel is integrated by just cutting some area of the terrain with a decal and replacing it with a mesh with the Terrain Lerp parameter enabled. A mesh integrated in a terrain with the Terrain Lerp enabled.